An exhibition of work by Ed van der Elsken, known as the “enfant terrible” of Dutch photography, will be on view at Howard Greenberg Gallery from March 22 through May 5, 2018. “Love” & Other Stories will focus on the celebrated street photographer’s work from the 1950s and 60s documenting the social culture around him in Amsterdam, Paris, and Tokyo. An opening reception will be held on Thursday, March 22, from 6-8 p.m.
One of the leading street photographers of the 20th century, Ed van der Elsken began shooting photography on the streets of Amsterdam after WWII, inspired in part by the publication of Weegee’s Naked City in 1945. He moved to Paris in 1950 where he worked in the darkroom at the Magnum Photos agency, printing photographs for Henri Cartier-Bresson and Robert Capa. In Paris he encountered the bohemian society of Saint-Germain-des-Prés and its bitter post-war malaise, and met his first wife, photographer Ata Kando. In 1953, his photographs were selected for two exhibitions by Edward Steichen, the curator of photography at the Museum of Modern Art in New York, whom he met in Paris. Steichen encouraged van der Elsken to create his groundbreaking photo novel, Love on the Left Bank, 1956, which is now a classic. He went on to publish more than 20 photography books. In 1960, he and his second wife, Gerda van der Veen sold all of their possessions to travel around the world for over a year. The book that followed, Sweet Life, 1966, is considered one of his major accomplishments. In 1971, van der Elsken and his third wife, the photographer Anneke Hilhorst, settled on a farm in Edam in the Netherlands. 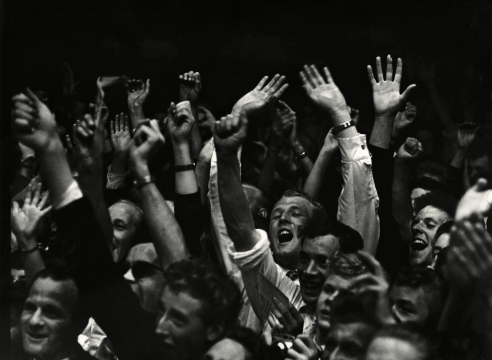 Van der Elsken's work has been widely shown at contemporary art museums throughout the world. Recent solo and group shows were held at the Museum Boerhaave, Leiden, Netherlands, 2014; Stadsarchief, Amsterdam, 2014; Netherlands Fotomuseum, Rotterdam, 2010; Foam, Amsterdam, 2005; The Metropolitan Museum, Tokyo, 2003; and The Palazzina di Giardini, Modena, 2002.